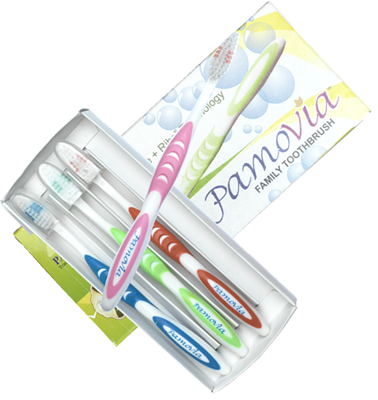 The brush offers ends rounded DuPont bristles and filaments that are gentle to teeth and gums. This will help prevent gum bleeding and irritation. Slender neck design ensure free movement within the mouth to ensure effective brushing. The “New Wave + Ribs Technology” will assist the compact head bend gently and absorb brushing pressure that might otherwise have irritated or damages the gums. The gentle active tip design will ensure thorough cleaning of the rear molar. Unique rubberized non-slip thumb grip of the brush has been specially designed to give excellent brush control. The unique handle design provides optimum comfort making it a pleasure to hold and brush.